Say Renaissance and I think of Italy: Florence and Tuscany, Milan and Venice, Rome and its surroundings. This is not only where the Renaissance was "invented", it is also where it bloomed most excessively. Therefore, seeing Renaissance style and art anywhere north of the Alps always hits me as somewhat unexpected and peculiar. The most impressive piece of Renaissance art in Austria is Schloss Ambras, a castle just outside of Innsbruck. Well, actually it is inside of Innsbruck, as the village Amras, where it is located, was merged with Tyrol′s capital in 1938. The castle is among Austria′s most popular tourist destinations and managed by the Kunsthistorisches Museum Wien, the Museum of the History of Art in Vienna. It was built by Archduke Ferdinand II, who was the brother of Emperor Maximilian II. Ferdinand got secretly married with a woman who wasn′t noble. This was tolerated by the main line of the Habsburgs, but his children were excluded from the succession - they could not become Emperors nor inherit the rule of Tyrol. 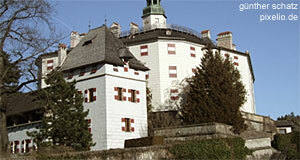 The castle was designed by Italian architects and built after Ferdinand had become the governor of Tyrol in 1563. With several urban centres such as Innsbruck, Schwaz and Hall alongside with the valuable silver mines, the Tyrol was a key possession within the rapidly expanding Austrian line of the Habsburg Empire. As a classic example of a Renaissance ruler with loads of gambling money, Ferdinand spent a great deal of interest and financial support to arts and sciences. He collected portraits and armour, which you can still see in parts Schloss Ambras, although the majority has been transferred to Vienna. Even more interesting was the "Wunderkammer" or "Chamber of Miracles", another Renaissance invention and the ancestor of modern museums. This was a collection - or rather wild array - of objects from art and nature. Other Germanic "Wunderkammern" were in Munich, Salzburg, Prague and Dresden, but most of them were developed in the following centuries or dissolved. The collection of Ferdinand, however, is still almost complete and in place at Schloss Ambras. Austria′s most famous salt cellar, the "Saliera" was part of the collection. However, it is now in Vienna. Nevertheless, Schloss Ambras still makes a fascinating example of the Renaissance′s awakening interest in the causes of things outside of religion. The interiors of the castle are quite remarkable, too: The "Spanischer Saal" (Spanish Hall) was the representative main hall of the castle and is still used for concerts during the summer season. The parks around the castle are a bit of a break with the Renaissance tradition of the building. It was modelled in the "English Style" the way Capability Brown brought to perfection. Don′t get me wrong, I do appreciate English Gardens very much and have spent innumerable weekends exploring the formal gardens of East Anglia, Cornwall and the Cotswolds - but around a Renaissance castle in Tyrol, it is a bit out of place, regardless of its prettiness. In the eastern part of the park, you will find remains of the original gardens. Getting to Schloss Ambras Castle from Innsbruck is an easy task: Just hop on a train of the Mittelgebirgsbahn Igler. Nearby Ambras you will also find a scenic little gorge called Schönruh, which is well worth a stop for some nature in addition to the art of the castle.